The hummingbird is arriving for the summer! In shamanism we look to nature & animals to build relationship with Mother Earth.We also observe animals to understand the lessons and knowledge they bring to our lives. The Harbinger Hummingbird announces what she brings to us energetically as we move into the sunny, warm months of the year! Hummingbird is the harbinger of the magical & the epic! The hummingbird can hover in mid air and their hovering path takes the shape of the figure 8; reminding us of the infinitude of our souls! When hummingbird hovers we see what appears to be a suspension of time. We are reminded of sacred time; the place of no time and the space beyond time. Our lives take shape in the physical world where the confines and limits of time shapes everything in this plane of existence. Hummingbird defies the impossible and in her high flying and high vibrational motion she sees outside of time. She sees the past, the present, and the future from her high vantage point. Hummingbirds brings us the light and the way of healing. Hummingbird invites us to look at the past and shows us how to let go of those things we regret, are in grief about or that we remain angry about and continue to hold within us. She invites us to choose not to be constantly caught up in the sad, angry, limited memory and stories from the past and begin to appreciate that the past creates who we will become in the future. Without those experiences in our lives we would not have matured, grown and become who we are today! In this way we begin to understand and see how the past creates the future. Hummingbirds fly high and move at high vibration. They manifest the impossible in their lives. How we hold our experiences as stories within us is the paint that creates the canvas of our future self, future experiences and manifestations. Hummingbird invites you to rewrite your stories into heroic ones. Hummingbird is a hero and takes a migratory epic journey each year. She invites us to take our own epic journey and to challenge the way we hold our wounds. We are invited to become the observer of our life by moving upwards to a higher and broader view, the view from the perspective of the Soul. In this place of observance our lives will be viewed differently. From hummingbird’s vantage point we see, understand, and develop the ability to be a responder in our lives and not the reactor! Hummingbird is the teacher of joy and lightness. Her lessons of joy, calm, and stillness are many! 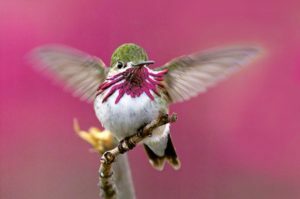 Hummingbird teaches us how to drink from the sweet nectar of life and to be present in the celebration of our accomplishments, successes, and ourselves. Hummingbird teaches us to go outside of time and into sacred time where we can see the past, the present and the future and make an impact in all three in order to create a future that is sustaining, satisfying, and brings you to your heart and your Soul’s path! Hummingbird invites you to heal the past by bringing light to those memories and stories within you so that your path into the present and future become paved with different myths; myths that enhance you into a state of thriving! Hummingbird is the harbinger of our freedom! Freedom from how we view the past and she invites us to embrace the idea that the events that were painful came as teachers and invitations to grow and heal. She beckons you to bring your healing strength to the world. When it comes to hummingbird meaning and symbolism this totem is powerful in a spiritual sense. Known for being bearers of light these joyful messengers who boldly set out on the journey of life. Hummingbirds are respected by those who understand them and know how to accept their ever-changing views and routines.